Free Footswitch and Orange T-shirt! Purchase a new Rocker-15 Terror or a Brent Hinds Terror Amp and get a free single button footswitch and a free Orange T-shirt! The single control on the natural channel has been redesigned with more bottom end but retains the finely balanced and highly playable character of the Rocker series. The dirty channel has a different 3-stage gain structure. It’s brighter at lower gain levels and fattens up the more you dial the gain in. The new gain structure also means that the gain comes in more quickly. Power switching options of 0.5, 1, 7 or 15 Watts make it perfect for bedroom, studio, and stage. Using the beefy Terror transformers, theBrent Hinds Terror is able to take full advantage of the EL84 output section, giving players the ability to create warm valve compression and saturation at neighbor friendly volume. The Brent Hinds Terror switches between 15, 7, 1 and half a Watt. When in Bedroom mode, the circuit has been designed to retain the springiness and feel of tube amps, a sensation that often gets lost with some attenuator designs. This makes for great tones in the practice room or in the studio, with the option to step up a gear to full power 15 Watt mode for the stage. 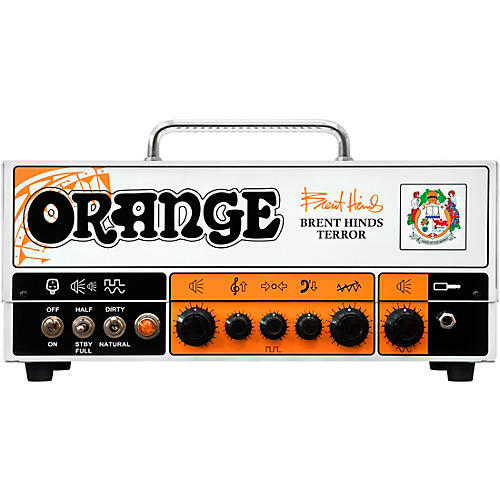 For the best possible tone and durability, the Brent Hinds Terror uses the same proprietary transformers found in all of Orange's iconic Terror Series. Like the company's flagship valve amp heads, the Brent Hinds Terror does away with plastic connector blocks and ribbon cables in favor of hand-soldered flying leads. The chassis-mounted switchgear is secured to the classic Terror series enclosure. As for the amp’s effects loop, Orange opted to keep the signal path all-valve to preserve the amp’s tonal integrity. The Brent Hinds Terror not only carries Brent’s signature it also bears his facial tattoo. The tribal imagery adorns the front of the chassis and Orange continues that theme on the settings markers. This amp is carries Brent’s uniqueness stylistically as well as tonally.